Even baby boomers have a difficult time remembering when tacos—like pizza—weren’t a ubiquitous part of the culinary landscape. (Glen Bell opened the first Taco Bell restaurant in 1962 and went public with his franchise in 1970.) Now, Americans eat more than 4.5 billion tacos a year. Tacos rank among our most beloved fast foods, good for breakfast, lunch, dinner, or a late-night snack after the bars close. The real deal tacos in Mexico come as a revelation: small pliable fresh corn tortillas electrified with bright, freshly made salsas. 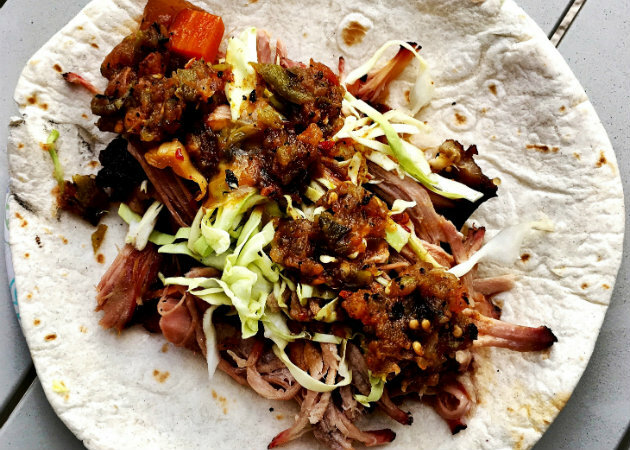 Serve them Yucatan-style—filled with cochinita pibil (achiote-scented pulled pork). Or al carbon (charcoal-grilled skirt steak tacos from Sonora). Or grilled fish tacos from Ensenada. Then there’s the uber popular taco al pastor (shepherd’s taco), made with thinly shaved chile-marinated spit-roasted pork and pineapple. Jeffrey M. Pilcher, a history professor who’s studied tacos for over 20 years, ascertains in Smithsonian Magazine that tacos were named after the small hand-rolled paper and gunpowder explosives (taco is Spanish for “plug”) Mexican silver miners used to break up rock faces. 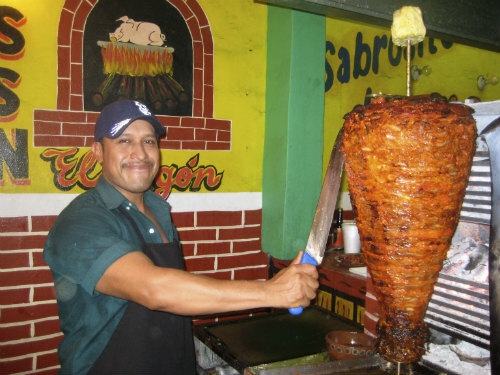 One of the first written references to tacos, he claims, was tacos de mineros (“miner’s tacos”); it appeared in the late 19th century. While the argument still rages south of the border over what tacos are authentically Mexican—they can’t deny the influence of the conquistadors and immigrants from the Middle East—in North America we have reconciled ourselves to eating tacos with multinational influences. One of the most successful iterations has been Chef Roy Choi’s Korean tacos, which he peddles from L.A.-based food trucks and a bricks and mortar location. Falafel tacos, Indian-influenced tacos, vegan and vegetarian tacos, Vietnamese banh mi tacos—it’s all good. It’s even better when you grill the ingredients for your tacos. Not just the proteins, but the vegetables, too. Here are three of my favorite combinations as well as links to several of my published recipes. Poblano, Corn, and Mushroom Tacos: Grill poblano peppers over a hot fire until blistered. Stem, seed, peel, and slice into strips (rajas). Grill the corn, turning often until the kernels show patches of brown. Slice the corn off the ear using long strokes of a chef’s knife. Trim the stems off crimini or portobello mushrooms. Slice, then place in a grill basket. Grill until the mushrooms are browned and have given up their liquid. Combine the vegetables, then season with salt and a pinch of cumin and/or chile powder. (I like Hatch.) Enfold the vegetables in warm white corn tortillas and top with shredded lettuce, fresh cilantro leaves, grated Monterey Jack cheese, and your favorite salsa. If desired, serve with rice or refried beans. Korean Chicken Tacos: If you have an extra hour, brine boneless skinless chicken thighs in salted water (1/4 cup of kosher salt per quart of water): your chicken will be more succulent. Dry thoroughly, then brush with toasted sesame oil. Trim the root ends off a few scallions. Grill the chicken until cooked through, about 4 minutes per side, depending on the size of the thighs. Grill the scallions long enough to give them grill marks. Let the chicken rest for 2 minutes, then slice or chop into bite-size pieces. Slice the onions into 1-inch lengths (green parts, too). Enfold the chicken and scallions in warm flour tortillas or lettuce leaves. Sprinkle with black sesame seeds. Serve with fresh cilantro leaves, thinly sliced jalapeños, kimchi or shredded cabbage, and Sriracha sauce or gochujang (Korean chile sauce).